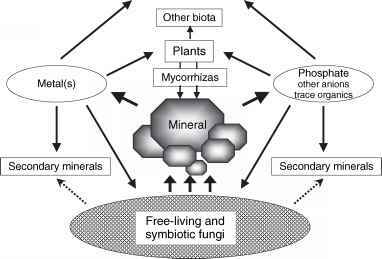 Fitness landscapes for real biological organisms are, in general, unknown. Only recently have direct studies of specific landscapes such as RNA and protein landscapes started to appear. 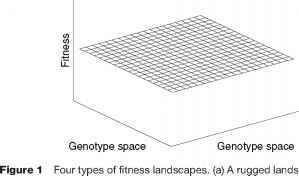 However, some general features of fitness landscapes can be identified using available data, biological intuition, and mathematical reasoning. Strong artificial selection in a specific direction usually results in a desired response, but as a consequence of the genetic changes brought about by artificial selection, different components of fitness (such as viability or fertility) significantly decrease. Moreover, after relaxing artificial selection, natural selection usually tends to return the population to its original state. These observations stimulated Wright's view of species as occupying isolated peaks in a fitness landscape. Following Wright, fitness landscapes are often imagined as 'rugged' surfaces having many local 'fitness peaks' of different height separated by 'fitness valleys' of different depth (see Figure 1a). Fitness peaks are interpreted as different (potential) species, fitness valleys between them are interpreted as unfit hybrids, and speciation is imagined as a 'peak shift'. Fitness peaks are important because of the expectation that natural selection will drive populations towards them. Within the framework of fitness landscapes, adaptive evolution is considered as 'hill climbing'. However, as soon as the population reaches a neighborhood of a local peak, any movement away from it is prevented by selection. It is important to realize that the peak the population has reached does not necessarily have the highest fitness. On the contrary, it is much more plausible that this peak has an intermediate height and that (much) higher fitness peaks exist nearby. Without some additional forces, a population evolving on a rugged landscape will stop changing after a relatively short transient time. population continuously climbing uphill and chasing a fitness peak that continuously moves away, as implied, for example, in the 'Red Queen' scenario. The metaphor of rugged fitness landscapes is often used within the context of finding an optimum solution out of many possible solutions to complex problems. In contrast to Wright, Fisher suggested that as the number of dimensions in a fitness landscape increases, local peaks in lower dimensions will tend to become saddle points in higher dimensions. In this case, according to Fisher, natural selection will be able to move the population to the global peak without any need for genetic drift or other factors. A typical fitness landscape implied by Fisher's views has a single peak (see Figure 1b). This view is based on a belief that (1) there is one perfect combination of genes (rather than a series of more or less equivalent alternative combinations), and that (2) this gene combination (fitness peak) can be found by selection without the need for any additional factors such as genetic drift. It also implies that large populations are the major source of evolutionary innovations because they are more responsive to selection than small populations. Although Fisher's claim proved to be unjustified, his metaphor finds numerous applications, for example, within the context of adaptation or error threshold. 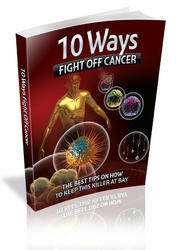 The major claim of the neutral theory is that most evolutionary changes at the molecular level are neutral (i.e., do not result in changes in fitness). A typical fitness landscape implied by this view is flat (see Figure 1c). The neutral theory explicitly emphasizes the possibility of extensive genetic divergence by stochastic factors in the absence of deterministic forces of selection. There is extensive theoretical literature on the evolutionary dynamics of selectively neutral mutations by random drift.